Ken Hubbs remains Bob Kennedy’s ”all-time” second baseman. Playing in a lineup that included future Hall of Famers Ernie Banks and Billy Williams in 1962 and 1963, the 22-year-old Hubbs was viewed by Kennedy as part of a team that would return the Cubs to baseball prominence. Buttressing Kennedy’s prophecy was a recent issue of Sports Illustrated that fantasized just how big a cog Hubbs could have been. SI suggested the Cubs with Hubbs would not have collapsed in 1969, and it would have been Chicago, not the New York Mets, who won the N.L. East, the N.L. playoffs over Atlanta and ultimately the World Series over Baltimore. Chicago was just 59-103 in Hubbs’ rookie season of 1962, when he hit .260 with 49 RBI and a .983 fielding average. In Kennedy’s first season at the helm in 1963, the Cubs improved to 82-80 although Hubbs’ average dipped to .235. His fielding held steady at .974. Hubbs was better known for his glove than his bat. He broke two major league records in 1962, playing 78 games and handling 418 chances without an error. In addition to 1962 N.L. rookie honors, he was honored by his peers with a Gold Glove. He was the first rookie to win the award. His brief career ended on Feb. 13, 1964. He and Dennis Doyle were killed instantly when the new Cessna that Hubbs was piloting crashed into Utah Lake in a snowstorm some 10 miles from the Provo Airport. For a baseball team whose modern history revolves around the concept of woulda, coulda, shoulda, there can be no better icon than Kenny Hubbs. He would have taken the Cubs to the World Series, some say. He could have made it to the Hall of Fame, they’ll tell you. On Wednesday, he’ll come as close as he’ll ever get. As part of the buildup for next week’s All-Star Game here, Hubbs’ family is donating to the Hall of Fame the glove he used as a rookie in 1962 to set two major league fielding records, along with the game ball from the day he set one of them–consecutive errorless games by a second baseman. Ted Spencer, chief curator for the National Baseball Hall of Fame and Museum, said he will immediately display Hubbs’ items along with artifacts from more famous baseball notables at the All-Star FanFest, which opens Friday at McCormick Place. Then he’ll take Hubbs’ memorabilia back to Cooperstown to join the museum’s collection, more “footprints in time,” as Spencer refers to the keepsakes from record-setting performances. Keith Hubbs, Ken’s older brother, met me at McCormick Place on Tuesday to show me the ball and glove and talk about his brother. If there’s one thing you don’t have to ask Keith Hubbs twice, it’s to talk about Ken, who would have turned 62 this December. “It’s nice to have just a little bit of him in the Hall of Fame,” said Keith, 65, a successful businessman and star athlete in his own right who moved to Wrigleyville with his wife six months ago on a Mormon mission. Keith showed me pictures of when Ken was a high school All-America in both football and basketball (“his best sport,” Keith says) in California, and told me how he’d been class president and a top student. He told me about the personal qualities that always set Ken apart: quiet, modest, focused, driven. He showed me the Sports Illustrated article from a decade ago titled “What Might Have Been,” in which the writer took a flight of fancy relating how Hubbs led the Cubs to five world championships (with the help of Brock, who was never traded for Ernie Broglio in this altered state of reality). Keith told me Billy Williams assured him they would have at least won in 1969. If you’re not old enough to remember Hubbs, Holly’s letter may give you a sense of how his death was received. It was a knife through the heart of Cubs fans, but the story of the untimely death of the young athlete with the wholesome, clean-cut image went beyond Cubdom. Keith Hubbs said he only recently found the ball, which was kept in a small pouch with two small black-and-white photos of Santo making the presentation. His mother then found the glove in a long-neglected equipment bag, just where Hubbs had packed it for the trip to spring training that never came. He died when a small plane he was piloting crashed in a snowstorm near Provo, Utah. It never occurred to them to sell the stuff. The Hubbs glove is notable mostly for its simplicity–a small Chuck Cottier autograph model made by Spalding. Hubbs used it while going 78 consecutive games and 418 chances without an error, which helped him become the first rookie to win a Gold Glove award. 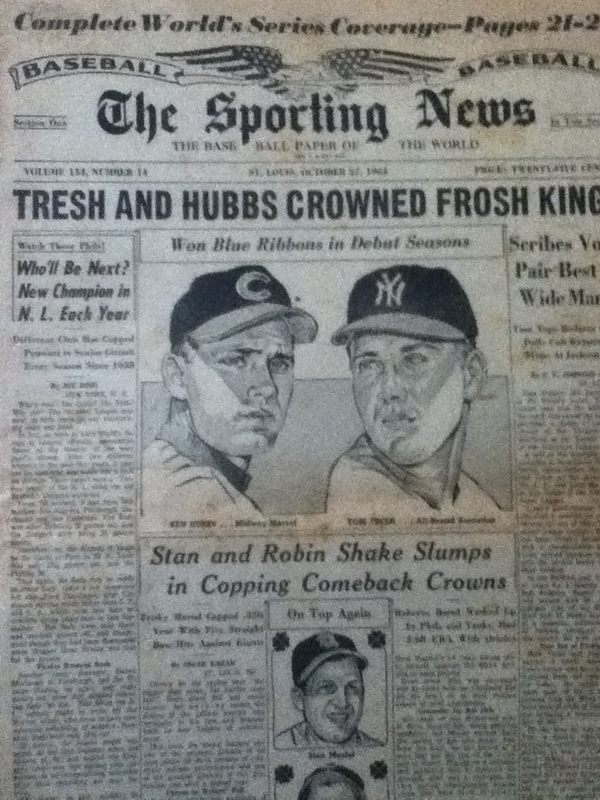 Here is an illustration and part of an article on Hubbs and Tom Tresh winning the ’62 N.L. and A.L. rookie of the year awards, from the Sporting News of October 27. More nice work, Arne. This was all before my time, but I can imagine how tragic it all must have been, especially to Cubs fans. I was fortunate, as a Cub fan, to receive a Blue Ribbon for best Groomed Dog at a small fair in Southern California presented by Ken Hubbs and then got to visit his home in Colton. I was about 11 and remember him as a really great guy. I was heart sick when he died. I had the pleasure of playing third base beside Kenny. Never saw him make an error even balls that I was able to knock down a bit so he could take them behind me. In the final inning of a playoff game my senior year a fly ball went up. It was my ball and I dropped it. We came up short that day. But leaving the field Kenny slapped me with his glove and told me “you will never forget that ball the rest of your life”. I have never forgot that ball or him. A fine buddy.